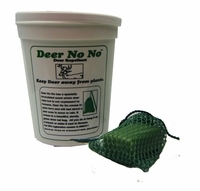 Deer No No is a product that protects your plants by using a specially formulated citrus smell that deer do not like. This product will deter deer yet the product is quite pleasing to humans. Each container holds 6 solid blocks wrapped in a dark green netting. Each block will last about a year if left out all season. Simply hang Deer No No around the plants you want to protect, place bags every 2-2 1/2 feet.